From July 13 to 16, Bob Boyles, Mike Weber and I made the first ascent of the north face of Mount Breitenbach. 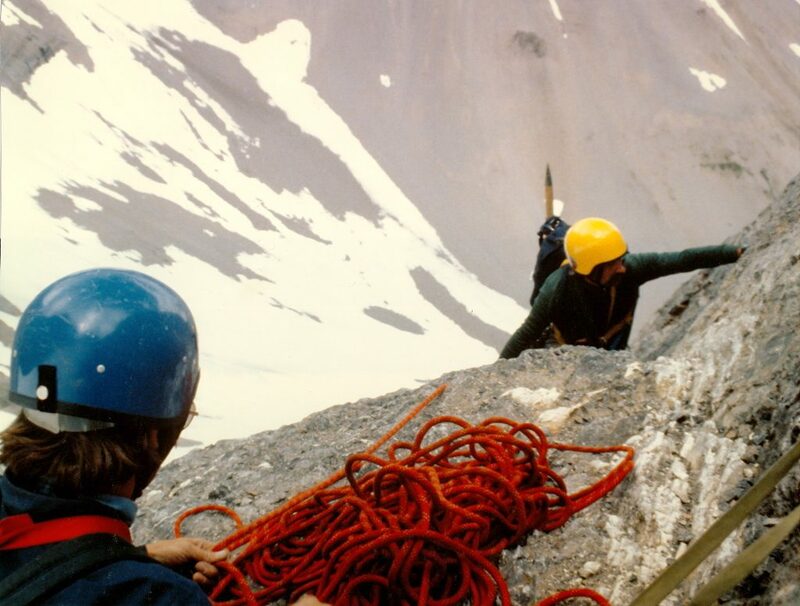 Bill March had told me that some years ago his party was turned back by very severe rock climbing at the top of a large couloir. We easily identified the couloir and rock band. 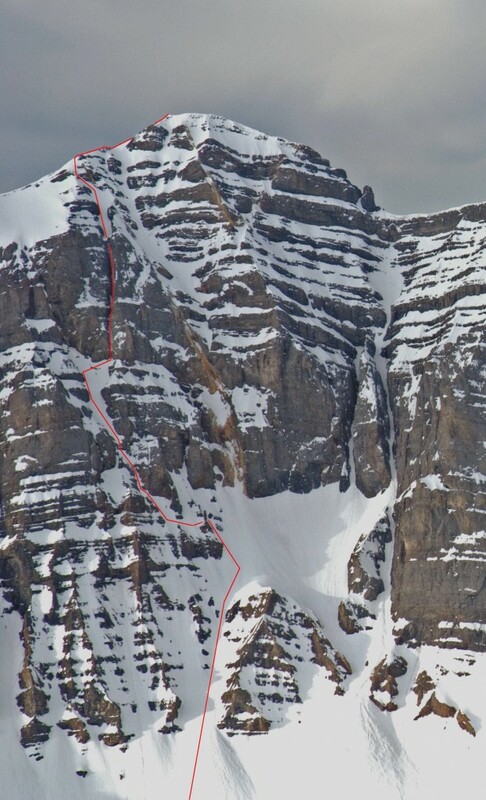 We also discovered a possible route to the west of that couloir but still east of the summit. We pieced our climb together. 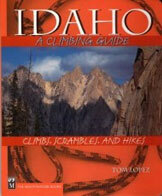 It consisted of small, steep snowfields intermixed with steep limestone. The crux was a short aid pitch next to a waterfall which led us into a 900-foot-long, 10-15 foot-wide hairline couloir that we followed to a bivouac on the skyline just east of the summit. 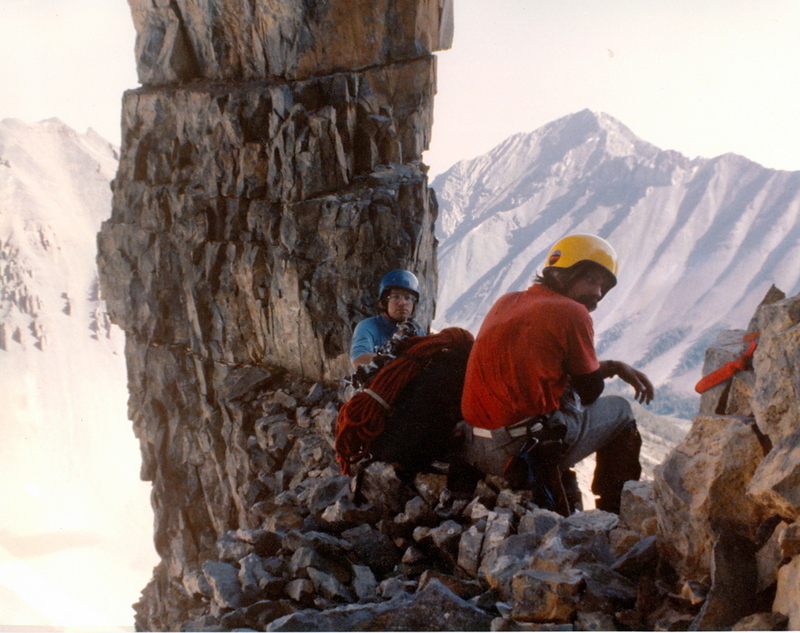 In the dawn, we descended the east-northeast ridge in 2 hours of 4th class climbing. On the second ascent of this route, Duane Monte and Kevin Sweigert bypassed the aid on the overhanging waterfall (A2) by using a free variation to the east (5.8). The Grand Chockstone Route on the North Face of Breitenbach is shown above in red. There is a freestanding limestone stack about 1/3 of the way up the route where the route bends 90 degrees. Amazingly, this stack appears to have survived the 1983 Borah Peak earthquake (magnitude 6.9) totally intact. This location is where the technical climbing begins. 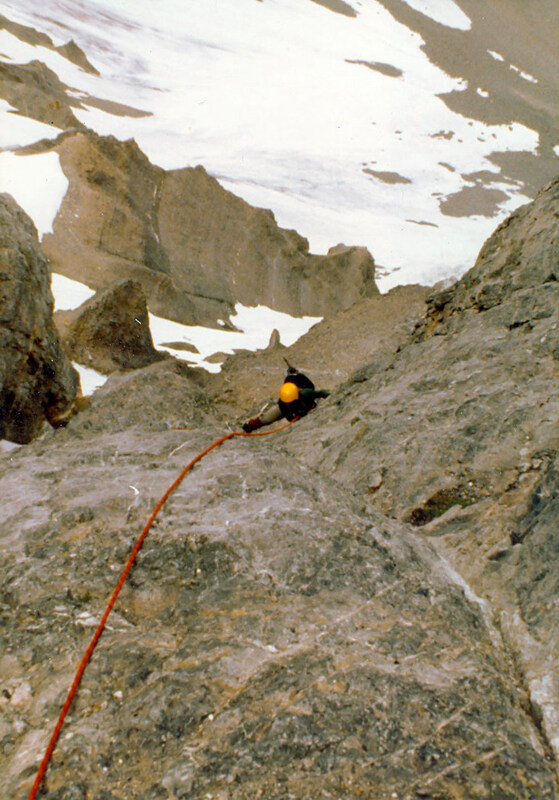 This photo shows Mike on the rock band pitch between two hanging snow fields. All three of us rated this pitch as a dicey 5.8. And from this point on, retreat is not a very good option. Here, Mike is topping out at a marginal belay spot. Curt had seven pieces of protection that consisted of copperheads and #1 and #2 stoppers strung together with equal tension slings on this belay. I clipped in and didn’t look at the anchors again until Mike finished this pitch. Faith be with us…. 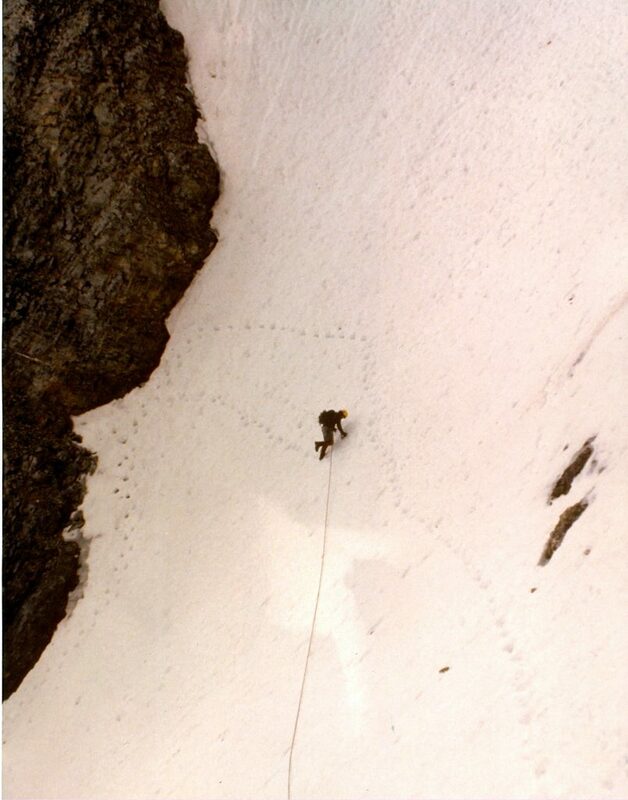 This photo shows Mike traversing one of the hanging snowfields to the waterfall pitch. Return to the main Mount Breitenbach page.